The Tennessee Tiny House Festival was the perfect destination as Hurricane Irma started her path up the state of Florida last week. I decided to leave for Chattanooga a day early to avoid the traffic, empty gas stations, and overall chaos of evacuation. While it wasn’t the easiest trip (there were still a lot of novice highway drivers on the road), waiting just one more day would have had me stuck at home in the path of the storm. This was the first time I’ve spent any time in Chattanooga, but I’m looking forward to going back when I’m not so stressed. It is a beautiful area and the people are incredibly nice. Like all United Tiny House Association festivals, the Tennessee event was a tremendous success, featuring more than 50 tiny structures, nationally recognized speakers, leading vendors in the tiny house movement, and more! 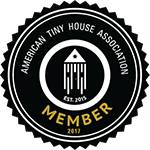 I had the privilege of working the American Tiny House Association booth to talk about the organization with other enthusiasts.